The City of Macedonia is a Charter city under a Mayor/Council form of government. Council represents the legislative side of government and the Mayor represents the administrative side. Council consists of five members elected at-large. Municipal elections are held in November of odd-numbered years. The term of office is 4-years. Terms are staggered so that three seats are up in one year followed by two seats in the next odd-numbered year. Council’s duties include adopting the annual budget, known as the annual appropriation; enacting legislation; confirming the appointments by the Mayor as well as establishing policy. Council offices, Council Chambers and the office of the Clerk of Council are located on the first floor, east wing of Macedonia City Center, 9691 Valley View Road. Council’s regularly scheduled meetings are on the second and fourth Thursdays of the month at 7:30pm in Council Chambers. Special meetings, committee meetings and work sessions of Council are scheduled as needed. In addition to these meetings, Council may hold public hearings on such subjects as zoning. All meetings are opened to the public. Persons wishing to speak during regular meetings may do so during the public comment portion of the meeting. Each speaker is limited to five minutes. The legislative record and minutes of Council are maintained in the office of the Clerk of Council. 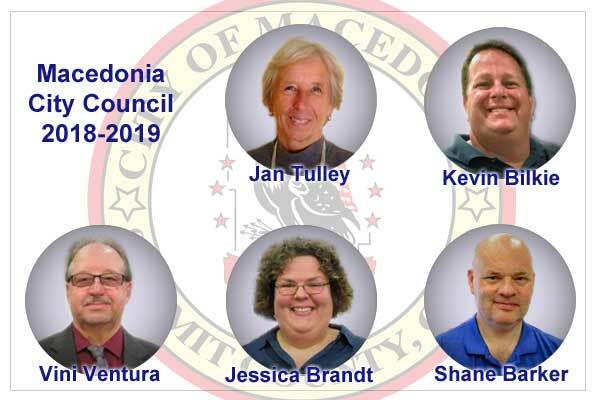 An agenda regarding council meetings is posted online (www.macedonia.oh.us) and outside the office of the Clerk of Council 48-hours prior to regular meetings. Official action by Council may take the form of an ordinance, a resolution or a motion. An ordinance is a municipal law which can only be amended or repealed by the adoption of another ordinance. A proposed ordinance requires three separate readings, on three separate days unless Council waives its own rules. A resolution may be used to express City policy, direct certain administrative or legal action or express a public statement. A motion is verbal instruction of a desired action.